Isn’t there just something about autumn? Isn’t there just something about autumn that makes you want to dance? Whether it’s the crisp air, the scent of woodsmoke, the glorious colours of leaves as they prepare for their flight to earth, autumn always makes me feel that little, measurable bit more awake and alive. And nothing moves better than a great Flexi skirt when you’re dancing. And nothing moves better than a great Flexi skirt when you’re dancing. If you’ve been in Second Life more than five minutes, you know it’s mesh for modelling, Flexi for dancing. So when I saw the GSC Linear Confusion Gown by G Sloane, I knew I had to photograph it in motion. And the texturing! If anybody had told me, “Gwen, one day you will fall in love with a dress that is pink and orange,” I would have laughed and laughed. But then I saw this dress. It had to have special hair, a special skin, and a special place. It had to have special hair, a special skin, and a special place. So I went back in my Lumae folder and found the freckled version of the Ruby Catwa applier, in a light tone that worked perfectly for the redhead I knew I’d have to be to pull off this dress. And for hair, well, I didn’t have to look very far, because Queue Marlowe made this amazing updo for Hairology, Ulna. There was also a colourway that incorporated just the right shades of red and pink, and off we went! 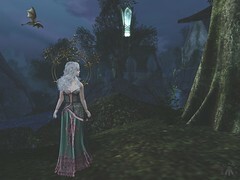 Add to that glorious green eyes from Mesange, perfect nail colour from Cazimi and Persefona‘s beautiful Floating Leaves accessories, and you have a great outfit. All it was missing were wings! Luckily for me, Lassitude & Ennui made a great set of Bento fairy wings, and the red was the perfect colour for the outfit. So imagine, if you will, the perfect autumn day. So imagine, if you will, the perfect autumn day. For me, it would be windy but not freezing, and I’d be in a place with glorious autumn trees, like the Fairy Garden on Awenia. Somewhere, you’d hear music, and it wouldn’t matter that you were alone with the trees: the wind itself would dance with you. The ground would glow with anticipation. The ground would glow with anticipation. And you’d step once, twice, three times, and be unable to stop. You’d twirl with the leaves, let the wind lead you. You’d bless the dusky day, bless the wood, bless the autumn. Oh, when you stopped, you’d bless the very air. And then you’d turn, leaves still wheeling around you, and seek the stability of the nearest oak. And there you’d find a prize much greater than a little golden apple. You’d find serenity. Peace, The good kind of tired. And maybe, tomorrow, when the wind picks up again, you’d think, I’ll come and do this again. And maybe, maybe you would. Meanwhile on White Owl Island…. You think you’re safe, don’t you? You think your haven is a sanctuary. It’s our sanctuary too, you know: you just don’t see us. I, for example, arrived only last night. I was running from something out of a nightmare. Since I’m usually the thing out of the nightmare, it was a bit of turnabout. But of course, every child of the Wild knows how you find haven, when the time comes. You leap, and you close your eyes, and you beg for haven. It’s a fairy story for fairies, or that’s what many of us say. Because so few of us have ever been in a situation we couldn’t get out of. But, despite the fairy story angle, here I am. Twilight. How cliché. A high wind. I probably caused that. And the wind, as winds do, spoke to me. It told me a story, a story of waking the mundane pigs of this world to that which they cannot see. I think this is the best idea I’ve ever heard. Imagine, all the sleepers in that big city—what’s it called? Oh, yes; Seattle—just a ferry trip away from a nearby pier, waking up one morning and discovering their doorman is a dryad. Their barista is a banshee. The taxi driver is a troll. Obviously we are not all so alliterative. There is, for example, no name for what I am. I am of the deep wood, the bits you don’t ever go in. The ones caught about with brambles and hiding nothing of interest, the ones so far in that it’s not worth going there. That’s where I am. Once the wind died down, I shortened my hair. Once the wind died down, I shortened my hair. Glamour is such a useful thing. Because I don’t know this wood well yet, I wouldn’t want to get all tangled up. Better to get rid of all that hair before some creature uses it against me. Yes, where was I… glamour. Such a useful thing. A funny, glowing light, just at the edge of that dark thicket. Wouldn’t you like to know what that is? It pulses, almost as if it’s alive. Maybe it makes a sound. Maybe it sounds like your friend laughing. I notice there’s a canoe hitch at the front of this pier. That’s a very good thing. Children love canoes. Sorry to make things less than easy, but for some reason my browser isn’t letting me put URLs into text tonight. Spiffy photos taken with the indispensible aid of my LumiPro. I never create possibly evil entities and stick them on a nice, peaceful role-play sim without it!